According to the makers of Catterbox, if Fluffy could speak, she would primarily say “No. No. 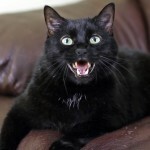 No.” Anyone who is owned by a cat shouldn’t be surprised to know that, much like a two year old toddler, a cat’s favorite word is “NO!” If I had to guess, my cat Pudge’s favorite word is probably “hungry” or “FOOD”! The Huffington Post has a funny take on Catterbox’s talking felines. If your feisty feline could speak, what do you think he would say? Is Science On the Outs?